Combine the beef cubes and flour in a resealable bag and toss to coat. Heat the olive oil in a large skillet over medium heat. Add the beef, and cook until browned on all sides. Also, preheat oven to 350°F. Meanwhile, whisk together the beef broth, cornstarch, red wine and garlic. Add to the skillet with the beef. Bring to a boil and then cook for 5-7 minutes, until slightly thickened. Taste and adjust seasoning as desired. Stir in the vegetables (still frozen). Pour the beef mixture into an oval oven-safe dish (a deep one). Unroll the Crescents dough, and fold it in half. Pat into place on top of the prepared beef mixture. We rarely eat beef in my house anymore. 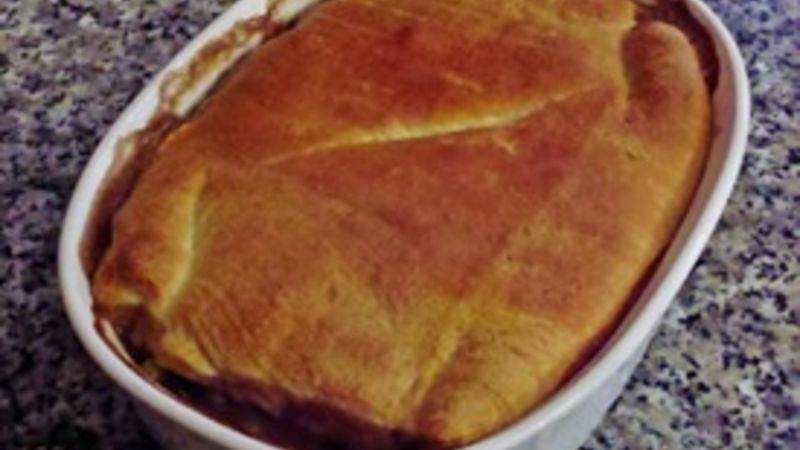 But when I decided to work on an easy pot pie recipe, I just wanted it to be beef … truthfully, in a preparation like this, I would take beef over poultry anyday. So, my Homemade Beef Pot Pie started with the beef. Actually, sirloin steak, to be precise. Yes, I could have used a less expensive cut, but I find that when you use the best meat you can, the result is better. The sauce for the beef is a quick homemade version. It’s just a few basic ingredients – a subtle amount of red wine, a little punch of garlic and a bit of cornstarch to thicken the sauce as it cooks. Don’t forget to taste it and adjust the salt and pepper as needed. Just FYI – Once you’ve made the super easy sauce, the hardest part is over. Next comes adding the veggies – frozen mixed veggies, actually – which cook as the pot pie bakes. As for the topping? It’s crescent roll dough, which makes a bready top that's perfect for sopping up the delicious pot pie juices. Ultimately, this homemade recipe can be made in an hour or less. Fast. Easy. Simple. Not bad for any night at all!